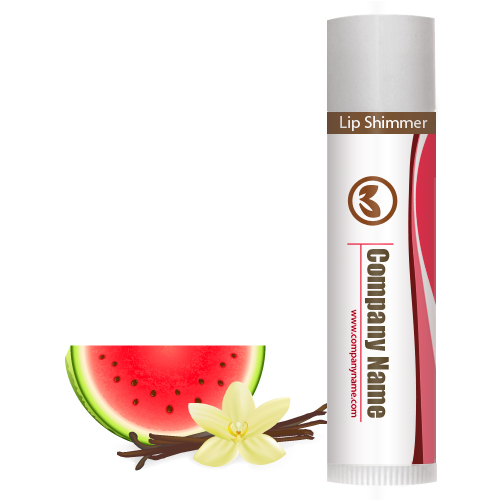 Personalized watermelon vanilla lip shimmer w/white tube cap is all about delivering happy smiles enveloped in delicious flavors of vanilla and watermelon. This lip balm acts as an effective healer and it helps to overcome dry, chaffed and chapped lips. It adds a tint of healthy shine to your lips and manipulates its appearance. Health Quotient –FDA approved formulation involving various synthetic and natural moisturizing ingredients such as coconut oil, beeswax, vitamin E, aloe oil, light mineral oil, etc. Harsh colorings, taste enhancers, perfumes and quality enhancers are not included in formulation. Saccharin included. PABA free. Directions – Rub watermelon vanilla lip shimmer regularly over dry lips for gaining healthier texture. Avoid using this lip shimmer over face for manipulating skin tone or as a moisturizer. Gifting Favors – Personalized watermelon vanilla lip shimmer w/white tube cap can be slipped into gift bags or it can be gifted by its own.